Take State Route 23 south to State Route 32, just past Piketon, Ohio. 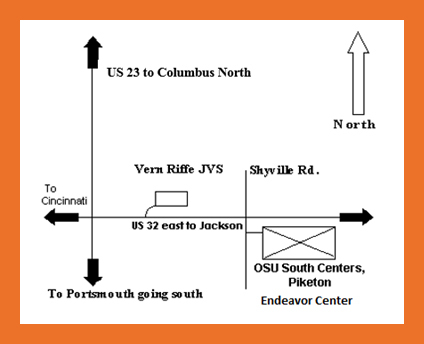 Take State Route 32 east for two miles, then take Shyville Road south for approximately two hundred yards, driveway on the left to the Ohio State University South Centers / Endeavor Center. Take State Route 32 west approximately twenty miles. Take Shyville Road south approximately two hundred yards, driveway on the left to the Ohio State University South Centers / Endeavor Center.